Tried a new process with my wheels and tires today. Took each one off the car. Hosed the inside and outside with Wheel Brightener, scrubbing with the Mothers wheel brush. 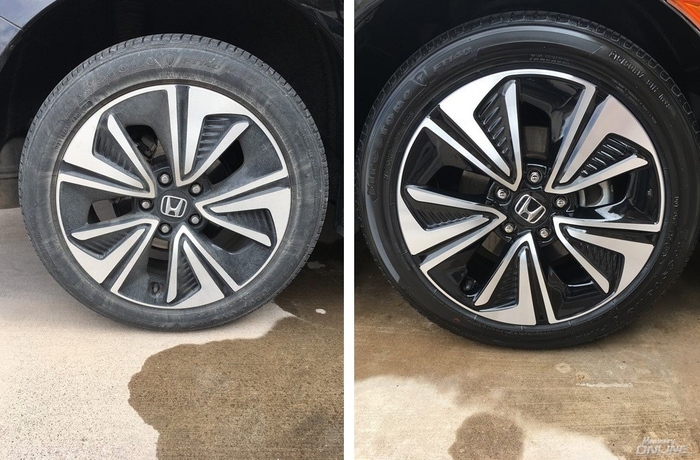 Then used Super Degreaser on the tires and used the Mothers tire brush on the rubber. Dried everything off with a cheap microfiber, then put Hyper Dressing undiluted on the tires using a Kraft Tool General Purpose Large Turtleback Sponge dampened. Remounted the wheel and moved on to the next. Personally, I love the results. Cool, It took the paint on the wheel well from primer to red. Haha... turn signal. The picture was from before I decided to do all four wheels yesterday, so all four were in the same bad shape to start, but the dirty is from the right rear, the clean is after I finished the right front. Looks great I try to also do a full "wheels off" at least once a year. Thanks for sharing. Nice work...Love the look of Hyper Dressing. If your tires and wheels are perfectly detailed, Your car will be benefited . Love this. Too cold too detail today? ?